At California Family Fitness, we are proud to offer our members a relaxing environment where families can cool off and enjoy the gyms with pools, but it’s very important to practice safety procedures at all times. By following our Pool Rules listed below, we can ensure everyone has a safe and fun summer! A parent or adult must supervise children under the age of 12. All children under the age of 6 must be accompanied by an adult in the water. Inappropriate public behavior will not be tolerated. 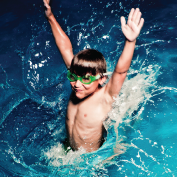 Special events and classes may restrict pool use. Please check with club staff. A 30 minute time limit for lap swimmers may be enforced. Multiple swimmers per lane may be necessary in the lap pool. Swimmers must dry off before entering the fitness building. All persons using the pool do so at their own risk. We are not responsible for accidents, lost property, or injuries. Swim diapers are required for any child not toilet trained. Lap lanes are designated for those actively swimming laps. Lap lanes are not for recreational use unless a special program is designated by the club (ie. aqua classes and swim lessons). When lap lanes are being used for family swim an adult must accompany children under 12 years of age. NO children in the hot tub under the age of 14. NO jumping, diving, horseplay, flipping, or running. NO sitting or hanging on lap lanes. NO smoking or drinking of alcoholic beverages at any time. Glass not permitted in pool area. Outside water flotation devices are not allowed unless authorized by the manager on duty. Be courteous of other members by cleaning up after yourself (food, snacks, and trash). The pool area closes 30 minutes before the club closes. All aqua class participants must be at least 12 years old. Appropriate, family-friendly swim attire must be worn at all times. This means full-coverage swim bottoms (ie. classic briefs and shorts) are allowed, medium to full exposure swim bottoms (ie. cheeky, and thong styles) are not allowed. CFF reserves the right to change or add pool rules at any time. A whistle means an emergency. If it is blown, listen for directions.